Prime Minister Ana Brnabić said today that Serbia remains committed to an integrated and stable region, but that it is not fair to insist on signing other agreements when Priština does not respect some of the basic regional agreements. After meeting with European Commissioner for Neighbourhood Policy and Enlargement Negotiations Johannes Hahn, Brnabić said that the main topics were the European path of Serbia and what the state does in terms of reforms and regional integration and cooperation, that is, everything that is within the framework of the Berlin process. When it comes to regional cooperation, she said that they also discussed the regional roaming agreement, which is important for citizens and the economy. 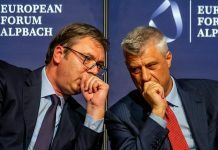 We have a certain amount of reserve to a regional agreement that comes at a time when Pristina continues to insist on violating the CEFTA agreement, taxes on products from Central Serbia and BiH of 100%, Brnabić said and thanked Hahn and everyone from the European Commission for unambiguously calling Pristina to withdraw this decision on fees. The Prime Minister noted that unfortunately Priština still insists on taxes that are a boundary to all other regional initiatives. Minister of European Integration Jadranka Joksimović and President Aleksandar Vučić and I reiterated that Serbia is committed to regional cooperation. Our position is that there is no regional security, economic prosperity for any country of the region without regional cohesion and stability, the Prime Minister pointed out, adding that for this reason, we are considering ways in which Serbia can sign this agreement. According to Brnabić, it is not fair that there is a further insistence on signing regional agreements when some of the basic regional agreements are not respected by Pristina. Brnabić added that Serbia remains committed to a region that is strong, integrated and that offers all citizens the possibility of a different perspective in the future. The Prime Minister stated that they mostly discussed the reforms in the field of the rule of law, and not that much reforms in the field of economy, where structural reforms continue and go quite well, both in the area of public administration, where Serbia has a sectoral budget support of €80 million from the EU. She explained that reforms in the field of rule of law are the most complex and that the rule of law is one of the areas where most effort is being invested. We also touched on the media strategy and praised the way in which we have completed the Draft Media Strategy within a broad working group, and completed the public debate and the process of receiving comments. We received over 250 comments on the Draft Media Strategy, which we are now looking at to fit into the final draft, said Brnabić, adding that she hopes that the final draft will be completed by the end of April at the Serbian government session with comments from the European Commission. She also stated that they also discussed Constitutional changes and expressed the expectation that constitutional amendments will be on the agenda during the spring session of the Serbian Assembly. The Prime Minister announced that the International Civil Society Week will be held in Belgrade on 8 April and that the Serbian capital will host the digital summit of the Western Balkans on 4 April. Brnabic thanked the EU and the Austrian Development Agency for their support for the reconstruction of the Golubac fortress.